Hemp's Clippers & Supply repairs and sells animal, beauty & barber clippers, vacs and blow dryers, power tools, butchering tools, and equipment. We have a large parts inventory too. Clipper repair has been our specialty since 1942. 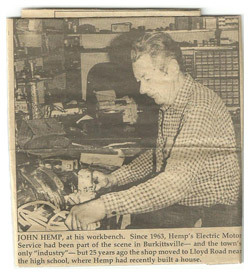 In that year my father, John A. Hemp, started the repair business in the small town of Burkittsville, MD. Being a rural area the majority of work was for area farmers repairing electric motors on equipment, tools and clipper repairs. My husband Tom started helping out part time in the family business in 1981. Tom's interest was the animal clippers. At that time Hemp's was already well known by local fitters and showers. Tom decided to advertise, that, along with word of mouth, we started getting clippers from all over the world. Since the passing of my father in 1989, we have continued the power tool and clipper repair business. We are a service center/distributor for Aesculap, Andis, Alpha-Laval, Double K, Heiniger, Laube, Liscop, Lister and Oster. We can repair your old brown Stewart Sunbeam Models 21, 31 and 51 cattle and sheep clippers! We are one of the few places in the country that still have parts to repair them. We sell and service vacs and blow dryers like Circuiteers, Electra-Groom, Metro, Dri-Eaze, Edemco, Double K, Oster and others. Our busy shop is located in Thurmont, MD where we ship and receive orders and repairs by Parcel Post and UPS daily. Visit our service center for more information on our clipper repair and blade sharpening services. Browse our extensive inventory of clippers, dryers, blades, and clipper accessories.